The stranger, a lowly sort in a self-imposed isolation, is named Mud (Matthew McConaughey), and his earnest demeanor inspires one of the lads into a dialogue. Ellis (Tye Sheridan) shows immediate interest, which builds into a quiet sympathy. Mud can’t leave the island for unknown reasons, but needs food, and is willing to pay for it if someone can bring it to him. The other, a suspicious kid referred to as “Neckbone” (Jacob Lofland), encourages them both to scram and steer clear of the stranger (a sentiment that becomes echoed passively by the majority of the adult characters in the film as the story progresses). 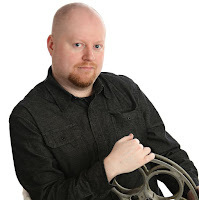 But Ellis keeps returning, eager to help in whatever ways he can, and adopts Mud as kind of a hobby in order to keep his focus off of a troubling home life. And as details regarding Mud’s past are gradually revealed, Ellis’ investment into this curious friendship is tested, and the way he looks at the world is molded in such a way that will reveal all the cracks in his own innocence – details that have become obligatory in plots that deal with impressionistic teen boys, really. You would think after this much time that the formula would be tired enough to negate the need for more endeavors of this nature, but “Mud” has interesting things to say, and does so in a manner that is distinctive, impassioned and truly effective. 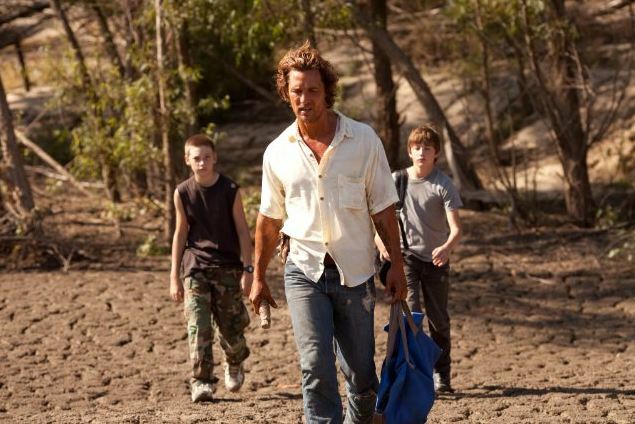 Part of that is due to the enigmatic nature of the Mud character, played here by Matthew McConaughey as a likeable sort who doesn’t so much manipulate his way into the lives of his two visitors as much as he finds a common bond in their youthful values (all men, after wall, were once boys themselves). An intriguing relationship between him and Ellis becomes the picture’s core, mainly because both seem destined to the same series of disappointments with girls: the teen idealizes love as something simple and pure, while his older friend, caught in the latest chapter of conflict associated with a woman named Juniper (Reese Witherspoon), maintains a certain optimism in romance that his young friend finds refreshing. This is contrasted by the marital status of the boy’s parents, however, who treat each other coldly in passing during the first act, and then reveal plans for divorce just when Ellis becomes set in his conviction to help Mud with his own girlfriend. What forces their secrecy? And really, why does Mud refuse to venture into the community at all? A plot involving a great crime in his past is the tipping point, and Juniper’s arrival (as well as Ellis’ mediation between them) comes at a time just as all of Mud’s old enemies gather nearby like sharks stalking prey, waiting for knowledge of his elusive whereabouts. The movie takes place in Arkansas, in a meek rural community where people often speak in those deep southern euphemisms, stare off in silence when tensions between one another are obvious, and spit in each other’s palms before handshaking on big agreements. That sets the audience up for an inevitable series of establishing shots of houseboats and riverbeds, of which they are an ample supply throughout (but nonetheless photographed effectively). What exactly intrigues filmmakers about the south in stories like this, anyway? Not having seen either of director Jeff Nichols’ prior endeavors, I suspect his motivation is similar to those who have made comparable pictures: the muted stillness of swamps provide an eerie backdrop, and more sophisticated locales might overwhelm the simple but pointed dialogue exchanges necessary of thrusting the story forward. Dramas about ingenuous people know that they are usually too primitive to say more words than necessary, and the screenplay makes that realization from the very first moment. Much of the dialogue is of vital importance to the conflict, and the remainder is either for strategic character development or isolated pieces of wisdom (“God put snakes on Earth for us to fear”). Contrary to the indication of the title, the movie is not directly about Mud or the mysteries that surround him, but about the world as Ellis sees it: about the warnings of adults who don’t always see the full picture, about relationships founded on faith rather than immediate trust, and about the consequences of a youthful outlook without knowing the dangerous paths some must walk in life. Often the movies absorb these ideas in plots that are eager to retread to action and violence, but Nichols finds a resonating and sharp tone here that understates those desires. 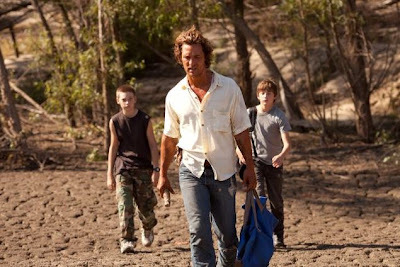 The picture is well acted by McConaughey and the two young leads (Sheridan and Lofland), and the screenplay is pointed in the way it reveals details for the sake of character development over audience satisfaction. By the time it is over, you not only walk away with the sense that you’ve learned something great about all of these people, but also something lasting about human nature too. “Mud” is one of the best films of the year, and surely one of the more thoughtful.